Frank Wolf, president and co-founder at Staffbase. In this article, Frank Wolf—from the mobile-first employee communication platform Staffbase—explores the effectiveness of Office 365, especially as it relates to employee communication and adoption. Are his arguments one-sided? Only to a degree. Are they sound? Very much so. But judge for yourself and let us know. You can also read our previous interview with Frank Wolf (Mobile intranets kills the internal communications propaganda machine from November 16), in which you’ll get a good sense of his vision for the future of internal communication. Microsoft has positioned Office 365 as an integrated platform that can solve multiple employee workloads, with the added benefit of helping enterprises avoid a mix-and-match approach of tools from different vendors. Companies can theoretically streamline their digital workplace and save money while doing so. But as pointed out by Tony Byrne of the Real Story Group, "It's revealing that Microsoft almost always tries to pitch O365 to senior IT leadership and your CFO, rather than workplace business leaders [who] have rejected parts of Office 365 when given a chance to try it hands-on against reasonable alternatives. A key issue here is that customers must largely accept O365 services and user experiences ‘as-is,’ at a time when digital workplace leaders are trying to adopt employee-centric user journeys. 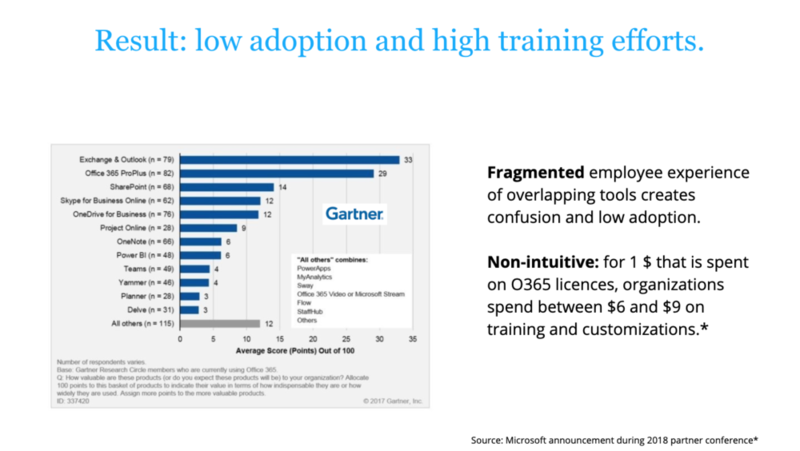 It can be difficult to map employee journeys with O365 experiences since the platform tends to be feature-rich, but application poor." It's also worth noting that Microsoft has introduced many Office 365 tools in response to market-share competition—not the needs of its users. This explains why many of its services are redundant when comparing their capabilities side by side. These limitations have become increasingly problematic as newer workplace demands like the employee experience have put a premium on communication and culture-building across enterprises, i.e., the large groups of dispersed employees—including top-down groups, bottom-up communities, and individual teams—who can't all be reached in the same “cookie-cutter” way. If you ask about employee communication and how it relates to Office 365, IT leadership will typically say, "We have SharePoint, Yammer, and Teams, and these tools will be ‘good enough.’” But they’re ignoring the serious issue of overlapping use cases, plus the confusion and poor adoption that stems from it. Which tool do I use for which job? “Which tool do I use for which job?” is an all-too-common question for Office 365 users. 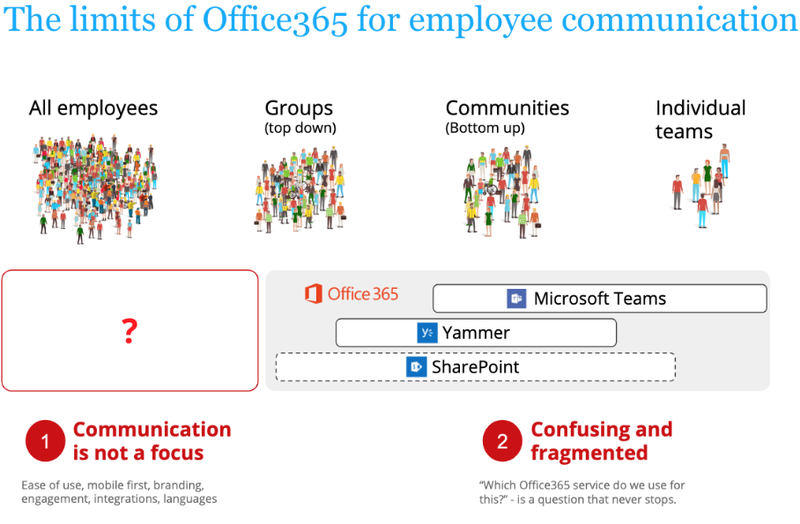 Confusion between Teams, SharePoint, and Yammer is rampant. Yammer, for instance, was developed as a way to compete with the allure of Facebook and Twitter, and while it’s great for answering questions quickly, it lacks archivability, and is less helpful for finding older information. So perhaps Teams is the better option, although it was designed with collaboration among small audiences in mind. Jacqui Olkin, a user experience consultant and information architect who has worked with SharePoint since its infancy, notes that "there’s a lot of confusion about how to use the products bundled in Office 365, and it requires a good deal of effort to develop a strategy, migrate existing assets, and train and compel people to use the tools consistently and properly. Many companies aren't equipped to put in the effort needed to succeed. By contrast, practical, usable tools announce their value and are a natural fit with users' other tools and habits." Such a confusing and fragmented user experience is a turn-off to employees, who are often left with a bundle of decisions and no clear direction. These less-than-intuitive tools aren't designed to be mobile-first, they lack custom branding, they're difficult to integrate, and they aren't available in multiple languages. With so many shortcomings and overlapping functionalities, overwhelmed employees might very well resort to using only the Microsoft tools they’re familiar with. The result is poor adoption and a serious lack of engagement. The ultimate reality for organizations is that they face the potential of being bad at both document management and communication, as employees fall back on emailing Word files back and forth with little accountability—hurting both collaboration and communication in the process. And forget about saving money. According to Gartner, for every dollar spent on Office 365 licenses, organizations are spending between six and nine dollars on training and customizations. SharePoint has been a huge success for Microsoft, and it's now on the verge of completely conquering the intranet market. About 50% of organizations worldwide are already running or on their way to running SharePoint intranets, and it’s fairly certain that this trend will continue to build in the coming years. That being said, a SharePoint intranet takes a great deal of time and effort to build and manage, and it doesn’t come cheap, particularly when compared to a growing number of out-of-the-box offerings. As an IT-focused platform with a fundamental strength as a file storing system, SharePoint's DNA isn't suited for use by regular employees. Combine its many weaknesses with a need for constant IT assistance, and the result is an intranet that will fail to evolve and engage the changing requirements of the audience it's meant to serve. None of this is to say that SharePoint lacks workplace value. But getting its full worth means configuring it and other Office 365 applications alongside platforms and applications that are purpose-built for a mobile-first experience and focused on disseminating both company-wide and targeted, local communication in a way that is interactive, engaging, and consumer-grade. Despite its popularity, a SharePoint intranet is certain to involve a great deal of time and resources. It is far from being the ideal solution for large organizations looking to create a digital workplace that fosters employee engagement and communicates in the culture-building ways now essential for modern enterprises with dispersed workforces. A platform built specifically for effective mobile-first communication and ideal for presenting outward-facing enterprise information, provides a quicker, smarter, and more cost-effective intranet, while still allowing you to benefit from SharePoint's core strengths as a document management system. Interested in continuing the conversation and gaining insights into your work with employee communication? Consider joining internal communicatation professionals from around the world at the Boye 19 Brooklyn conference where you can find a Modern Workplace conference track. In Europe we also have two peer groups focused on Future Workplace.